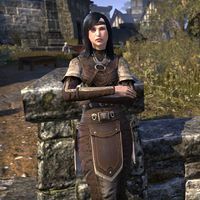 Moumou Edier is a Breton clothier found in the city of Evermore. She leans against a stone wall across from Pelin's Watch Stables. Moumou has a lot to say about the current situation in Evermore. "I would walk on if I were you, stranger. This town is cursed." "A better question might be what hasn't happened. We've been beset by all manner of horrors in just a few days." "Our beloved King Eamond fell in battle against the Reachmen—and so did his son." "You must know of the Reachmen. They're the wild clans who live in the mountains north of Evermore. They've come over the border in force and are nearer to the city every hour." With the king dead, who's in charge here? "Rulership should fall to Queen Arzhela, but she... I hate to speak ill of our queen, but she simply doesn't have the constitution for that sort of thing. "As well as can be expected, I think, under the circumstances. But that's just one woman's opinion." What's with all the black birds? / What's with all the crows? "Oh, the birds. Curse them. They started gathering shortly after King Eamond's death. Just three or four would gather at first ... then ten ... then twenty. And soon enough we were overrun." Does anyone know what's bringing them? "No. But it certainly seems like an ill omen. After them came the refugees from North Glen [sic], escaping the Reachmen. If I were them, I'd seek refuge at sea or in Stormhaven. Grim times, grim times."